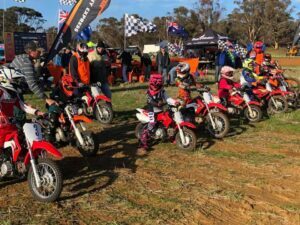 After months of planning it was finally the first round of the KTM Brookton Pony Express, 55 junior entries and 155 senior entries, in a picturesque paddock of Brooklands Park Pastoral owned and run by the Edwards Family of Kweda who we cannot thank enough for their help and hospitality. The juniors raced for 1.5 hours on the 18km circuit then a ½ break and back for a 1 hour to finish off the day, this year Dirt High Promotions have teamed together with Motorcycling Western Australia’s timing duo Angela Bascombe and Paul Donohoe to electronically time all the rounds with the AMB transponder system. With all riders equipped with a transponder, the timing and results will be efficient and accurate. There was huge competition between riders in the junior classes and we hope to see them all back at round two to back up their results and continue to accrue points. What little champs these guys are forever fearless and on mostly 110 machines Hunter did 6 laps in just over 3 hours that 108km’s!!! Winning with a whopping 5 minute lead in the 65cc class was Oskar Thomas, congratulations Oskar!! First, Second and Third all on 7 laps. David with 8 laps was applauded for his position and ability to get those laps in on the small wheel machine. This class was so competitive with 10 in the field it was a great effort for them all. Now this class so closely tied on ability was fast and competitive with winner Zane Plati getting a massive 9 laps in that’s 162km’s in just under 3 hours, we welcome back Evan Browne who was away with injury for the last half of 2017 and look forward to watching him take up the challenge laid down by Zane. The Recreational class made their impact on the track and the podium just by being so damn cute. With 115 riders showing up to Prologue we knew the race was on those guys deadly serious and all vying for a spot close to the pointy end and mega bragging rights to be had around the fire later in the evening. Darren Rudling #1 plate holder in Enduro’s for 2018 completely the 18km course with a 17:05 minute lap time, a time which he beat during the course of the 4 hour race on Sunday as an Ironman!! close on his heels but 11 seconds behind was Expert rider Scott Hewitt, after the prologue was run and won 115 riders lapped between 17:05 minutes and 34 minutes, controversy reigned when officials decided that many Clubman teams were so fast on their prologue times they were regraded to Expert. The controversy didn’t last long and a gentle ribbing to the newly elected Experts made them all so welcome to their new class ;). Noncompetitive Flat Track riding under lights always a highlight of these events was well subscribed and well watched under a picturesque sunset the track lit up and the riders took turns in classes riding the tight turns of the last 700 metres of the Pony course. The bonfire was lit the food truck from Wandering was busy filling dinner orders and the One Man Band kept the campers entertained with his repertoire. Race day dawned with a clear sky and a tad crisp I heard 1o but let’s not get bogged down in facts it was cold felt like minus 1o thank goodness Café 2 U kept us all filled with hot Coffee. The race was on, 4 continuous hours of 18km loops, there were dramas and tears lol no there wasn’t it was just great racing, good fun and amazing displays of sportsmanship and comradery between teams and individuals. Individual lap times can be dissected and compared on an APP called Race Monitor, you may have to register. Awesome racing from the Clubman 32 teams all together with Liam Garavanta and Troy Austin getting 12 laps into the 4 hour time frame. Only 2 teams in the Women’s class but what an effort, great work ladies one team ended up completing the Pony on one machine each Megan and Hannah getting an extra lap in over Emmily and Krystal, don’t forget to mention to any other female riders you know to come and sign up for a great race we welcome them. Campain and Yates fierce competitors in this class podiuming at nearly if not all last year’s rounds, these guys they know how to get the runs on board with 12 laps. When the reigning Veteran champions Hothersall and Morrison pulled out due to machine failure all the other teams finally got a look in, Team Hothersall/Morrison who prologued in 7th position only 1 minute behind 1st place it was on for the Veterans class, congrats to Nash and Thatcher for taking the top step for round 1. The premier class in the team events Foster and Hewitt were a class act but were closely followed by Cormack and Courtney both teams on 13 laps and only separated by 22 seconds. What a race!! Rudling took the first place with a somewhat broken rim held together with cable ties 13 laps in 4:18:26 that’s 234 km’s and he did it in style, 2nd place getter Nathan Johns first race back after injury that took him off the bike for the majority of 2017 was convincing in his efforts 24 Ironman, 21 finishers great job!!!! 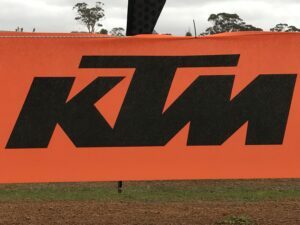 To the major Sponsors of the event, KTM Australia thank you so much for your fantastic support. 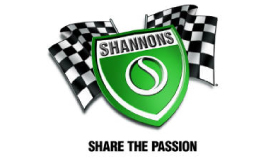 Shannons whose continued support of Dirt High events keeps us driving ahead to be the best we can be and offer the riders a variety of racing in WA that is second to none.